Gov. Sam Brownback on Tuesday appointed his chief counsel, Caleb Stegall, to the Kansas Court of Appeals, a year after Stegall was passed over twice for other appeals court slots by a judicial nominating commission. 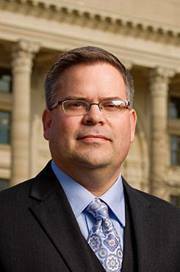 Stegall, 41, a Lawrence native who now lives in southeast Jefferson County, has been chief counsel to Brownback since January 2011, was Jefferson County Attorney for two years and founded and owned a law firm. He has been in the middle of several high-profile political cases, including at one point representing former Attorney General Phill Kline. Democrats, who had objected to changing the judicial selection process and had warned about the consequences of a less-public process, decried the appointment as cronyism. “The Kansas judiciary should be a pillar of independence and transparency, not a parking lot for Governor Brownback’s well-connected, partisan pals,” said House Minority Leader Paul Davis, D-Lawrence, who is considering a run against Brownback in 2014. Brownback’s nomination of Stegall is the first under a new law that gives him the authority to make a selection subject to confirmation by the Senate. Stegall was passed over twice last year for positions on the appeals court under the former law in which a nominating commission screened applicants and forwarded a list of three potential nominees to the governor. In the recently concluded legislative session, Brownback and his conservative allies passed the new law. In addition to the partisan rancor from that fight, the selection process became more controversial when Brownback refused to divulge the names of those applying for the vacancy on the state’s second highest court. In the past, the nominating commission released the names of those applying, its final recommendation, and had even opened up to the public its interview process. At the news conference, Brownback refused to allow Stegall to answer questions from the media, also a departure from past practice. Stegall did, however, make some comments after Brownback’s announcement. He mentioned former attorney general Steve Six and several other Democrats who wrote in his favor. Among the letters of recommendation for Stegall was one from Lawrence City Manager David Corliss, who praised Stegall for his work representing Family Promises, a non-profit that helps the homeless. Stegall helped the city “improve its regulations on homeless shelters to reflect certain public concerns,” Corliss said. Stegall’s legal experience has featured a wide range of cases. Stegall prosecuted a murder case and other major crimes as the lead prosecutor in Jefferson County from 2009 to 2011. Stegall received his law degree from Kansas University in 1999. He is married and has five children. In 2010, he helped defend a group of Topeka missionaries in Haiti who had been charged with kidnapping and child trafficking during the aftermath of the earthquake there. Working for no pay, he helped get the charges dismissed. Stegall represented Kline in a legal dispute with a Planned Parenthood clinic in Overland Park over Kline’s attempts to pursue criminal charges that the clinic performed illegal abortions and falsified reports about some procedures to the state, which it denied. Stegall also initially represented Kline in professional disciplinary proceedings stemming from his investigations of abortion providers. In 2009, Stegall, writing a lengthy analysis for the Kansas Policy Institute, was highly critical of the 2005 Kansas Supreme Court decision that led to increased funding for schools. Stegall will now appear before the Senate Judiciary Committee, whose chairman, state Sen. Jeff King, R-Independence, has enlisted the assistance of three prominent legal scholars — Deanell Tacha, Stephen McAllister and Reggie Robinson — to draft a six-page questionnaire for the nominee. Tacha is former chief judge of the 10th U.S. Circuit Court of Appeals and now dean of the law school at Pepperdine University in Malibu, Calif. McAllister, the state’s solicitor general, is a professor and former dean at the Kansas University law school. Robinson is a former president of the Kansas Board of Regents and director of the Center for Law and Government at the Washburn University law school in Topeka. Two of the three — Tacha and McAllister — wrote letters of recommendation on behalf of Stegall’s nomination to the bench. Stegall’s confirmation will be up before the Senate during the special legislative session that starts Sept. 3. Brownback called the special session to address a U.S. Supreme Court decision that raised questions about a Kansas law that allows some convicted murderers to be sentenced to life in prison with no chance of parole for 50 years. Some Democrats have said the upcoming special session will give legislators little time to examine Stegall’s record.